Diederik Wolsak's Choose Again Six-Step Process has been quietly transforming lives for more than 20 years. 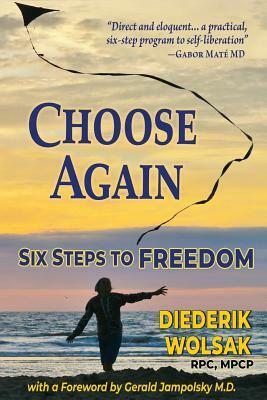 His clients have begged him to write a book so that his life-changing technique can be widely shared, and now here it is CHOOSE AGAIN tells the inspiring story of Diederik's journey from childhood in a Japanese concentration camp to his healing center in Costa Rica. As he transformed himself from a self-destructive, self-loathing bully to an extraordinary healer, he devised the Process that turned his life around-and which can dramatically increase the joy and peace in your life. By mastering the Choose Again Six-Step process, you can expect to decrease stress, increase joy, improve all your relationships, and transform your life for good. This deceptively simple method is now yours, to enable you to discover greater happiness than you ever thought possible. "It is with great enthusiasm that we recommend this book to you. Treat it with utmost respect, for it has the power and the potential to truly change your life." - from the Foreword by Gerald Jampolsky, M.D., Founder of Attitudinal Healing, Author of Love is Letting Go of Fear "From his early sorrows, and from the later suffering he engendered for himself as a result, Diederik Wolsak has fashioned a practical, six-step program to self-liberation. He transmits his teaching directly and eloquently, and with unsparing honesty. He has already helped many fellow humans; with this book he can help many more. - Gabor Mat M.D., Author, When The Body Says No: The Cost of Hidden Stress.